Don't you love a good book and a cup of tea on a cold winter afternoon? We do too, which is why every Sunday this winter we are running book excerpts with paired with a suggested tea. 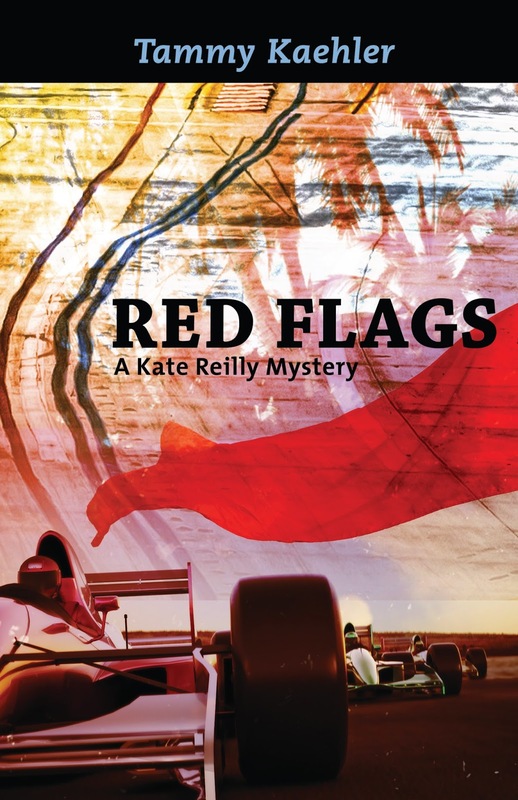 Today we have the fourth book in Tammy Kaehler's Kate Reilly series, Red Flags. Her protagonist, Kate, is a race car driver and there's no shortage of thrills in this book. 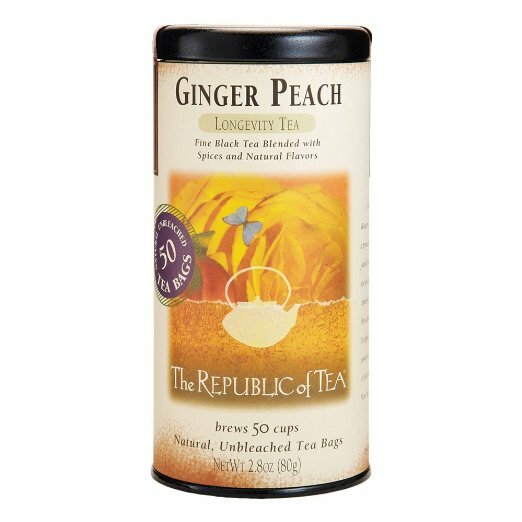 Tammy matched her book with The Republic of Tea Ginger Peach black longevity tea. Like Kate, it's complex but fun, and hoping for longevity is necessary for a women race care driver who solves murders in her spare time. I stared down at the man's face and tried to care that he was dead. I tried to ignore the bloody dent in his head and focused instead on his relaxed features, which lacked the cunning and malice they'd worn in life. "Do you recognize this man, Ms. Reilly?" I blinked as the Long Beach police detective prompted me for the second time. "Billy Reilly-Stinson. William." I paused. "He's my cousin." "My condolences for your loss." "I didn't know him at all." I looked at the cop. "I only met him two years ago, and he made it clear he didn't want me in the family." I glanced at Billy again, seeing the clumpy, oatmeal-like substance in the blood on his shoulder. My stomach lurched. Brain matter. I turned away and breathed deeply. The detective gestured across the parking garage toward the stairs I'd descended with him five minutes prior. I'd been a few hundred yards away in the temporary paddock for the Grand Prix of Long Beach Media Day, when he'd called asking for my help with something. His request seemed benign at the time. He walked me around the corner of a half-wall so I couldn't see Billy's body, which settled my stomach, but not my emotions. This was my third body in as many years, and I didn't like seeing anyone dead. I felt sorry for Billy and his family—my father's family—even if I had a hard time convincing myself I'd miss Billy. Then I felt ashamed I hadn't liked him and worried about my proximity to death. Again. The detective pulled a notepad and pen out of his sportcoat pocket. "What can you tell me about the deceased?" "You said you're Detective Barnes...you're with homicide?" He raised an eyebrow. "That's correct. Mr. Reilly-Stinson didn't do that to himself. We're looking for another party." I really didn't expect my ten-day trip to California to start with murder. I studied Barnes: stocky, bowlegged, of mixed Asian and Caucasian heritage. His face was comfortably lined, and his eyes shone with intelligence. I hoped he was smart and fair. I'd gone down the suspect road before, and I wasn't in the mood. "Ms. Reilly? What do you know about him?" "It's Kate." I stuck my hands in the back pockets of my jeans. "We were acquainted. We had no reason to communicate or be friends. Neither of us wanted to. We rarely saw each other." I considered. "I haven't run into him in more than a year. And I've never seen him alone. He's usually with his cousin, Holden Sherain." "Not that I've noticed." I bit my tongue on the fact I'd caught sight of Billy that morning and deliberately avoided him. "Can you tell me your whereabouts today?" I felt a flash of alarm at his question, even though I'd been through the drill before and knew I had an alibi. "I got to the track at eight to meet the race staff. From nine to twelve, I was in a pace car doing laps for media or I was with the woman I'm coaching for the celebrity race. I had lunch around noon with the other drivers. After that, more hot laps or coaching from one to when you called me. I've been with people all day." "Who can verify that?" he asked, then wrote down the five names I gave him. When a crime scene technician beckoned, Barnes crossed to the landing of the stairs where the tech stood next to a garbage can. A dozen other official types crawled around the half-full parking structure, moving from car to car, shining a flashlight under, around, and between, looking for evidence. Still others stood talking and looking down at Billy's body. I shivered, not cold, but remembering Billy's bloody head. I wrapped my arms around myself. I supposed I should be mourning Billy's loss of life. I did, in theory. But I hadn't liked the guy, and I wouldn't pretend I'd miss him. I did wonder how the rest of my family would take the news. I wanted to stay out of that. Barnes shifted, the movement drawing my attention, and I saw what he and the other man were looking at: some kind of pipe or stick and a wallet. The detective returned to me, looking down at his notebook, and I spoke before he could. "Was that the murder weapon? In the trash can?" He hesitated. "It could be. We'll have to test it to make sure." "How long ago was he killed?" My big question: "Why did you ask me to identify the body?" "The only item in the victim's pockets was a marketing card with your name and photo—a 'hero card,' someone said—with your cell phone number handwritten on it. Any idea why he'd have that?" To cause me trouble? "Those cards get handed out by the hundreds at a race weekend. I'm sure there are bunches here for the media today. I have no idea why he'd have one, especially not with my number on it, except we're both associated with Frame Savings." "My father's family founded the bank more than a hundred years ago. I think Billy works there. They've just come on as one of my major sponsors for racing." Barnes took notes. "Can you tell me Mr. Reilly-Stinson's next of kin? Who he was close to? A spouse, significant other? Best friends?" "All I know is Billy and his cousin, Holden Sherain, were as tight as brothers. Billy's father is Edward Reilly-Stinson. And my father, James Hightower Reilly, is Billy's uncle. I only have contact information for my father, but he'll know more." With the detective's approval, I called my father, identifying myself and handing my phone to Barnes. After that, Barnes asked one last question before letting me leave the parking structure. "You and the deceased didn't like each other. What was the problem?" "I'm going to need more." I sighed. "I was raised by my mother's family and never met my father or his family until a couple years ago. There's still...friction with some of his family, including Billy." Which wasn't helped by me uncovering his unethical and illegal activities a year ago. "We were antagonistic when we saw each other occasionally, but I didn't spend time thinking about him. That's why I don't know the family very well. I'm an outsider, and I plan to stay that way." He made a note in his book. "If you're both an insider and an outsider, your perspective could be useful. I'll be in touch." Fine, just don't make me solve this one.